Thanksgiving is a time when families give thanks for all the many blessing that they enjoy in life. They unite to break bread, spend time with family and of course shop until you drop. This was not the case for a family in Alabama who’s Thanksgiving day turned into a nightmare. An Alabama police officer fatally shot and killed a 21-year-old black man, Emantic Fitzgerald Bradford Jr., on Thursday night at a mall near Birmingham, turning a festive holiday shopping scene into a tragedy. Late Thursday evening, the holiday hustle and bustle of the Riverchase Galleria in Hoover, about 10 miles south of Birmingham Alabama, was sent spiraling out of control as a physical fight between two men erupted and resulted in a gun being drawn and fired. The two men had gotten into a physical confrontation. One of the men fired at the other, and the victim, an 18-year-old man, was struck at least once. Cellphone footage captures the moments after a shooting at the Riverchase Galleria left a suspect dead and two others injured. 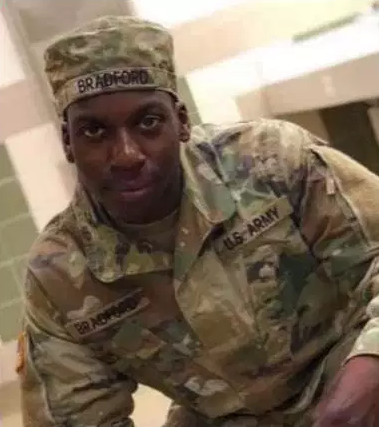 Police officials released an initial statement that said uniformed officers who were providing security at the mall “encountered a suspect brandishing a pistol and shot him.” It was not clear whether the officers believed Mr. Bradford fired or intended to fire before he was killed. On Friday the police said evidence suggests that the man actually WAS NOT the gunman and that the true gunman remained at large. The Hoover Police Department said on Twitter that the man who was killed, Emantic Fitzgerald Bradford Jr., “may have been involved in some aspect” of an altercation at the mall, the Riverchase Galleria in Hoover, Ala., that preceded the shooting. Police officials said, he “likely did not fire the rounds” that struck an 18-year-old man as they had originally indicated. Another victim, a 12-year-old girl, was an “innocent bystander,” the police said. Both were hospitalized but their conditions on Saturday were unavailable. Mr. Bradford’s Mother, April Pipkins stated that Bradford was living with her near Birmingham where he had been raised. I was not in Mr. Bradford’s, or E.J. as his Mother called him, character to be involved in something such as a shooting. He loved life and he loved people his Mother said. If anything, he would have been trying to protect fellow shoppers. Bradford’s family members gathered for a news conference on Sunday when the weight of the situation brought one of his family to their knees, reduced to tears. According to the family, they were notified of Bradford’s death through the Hoover Police Department, but instead, the family learned of the tragic events through Facebook and that of Social Media. Police officials told Emantic Bradford Sr., the father of the deceased, that they would call him back in 10 minutes after he made a call to the department upon hearing of the shooting of his son. Police officials never returned a call to Bradford Sr. After a few hours of silence, Bradford Sr. made another call to police officials and was able to speak with someone from the Jefferson County Sheriffs office that was on the scene. At this point, the Hoover Police Department is conducting an internal investigation into the Shooting of Bradford Jr.’s killing by the officer. The officer in question has not been identified, has been placed on administrative leave until the competition of the investigation. The police are now saying that they believe that more than two people were involved in the altercation that proceeded the shooting and that at least one gunman remains at large. There has been no description of the person believed to still be at large. At the law offices of Jones Brown, we pride ourselves on principles of honesty, hard work, fair dealing and compassion in our representation. Our attorneys and staff are committed to adhering to a strict code of professional ethics. We dedicate ourselves to our clients’ best interests and making the legal process as painless and simple as possible for the injured and their family. Our mission is to make accessible legal help and services for everyone by answering questions at no cost and with no obligation. We aim to make the world of law understandable to all.